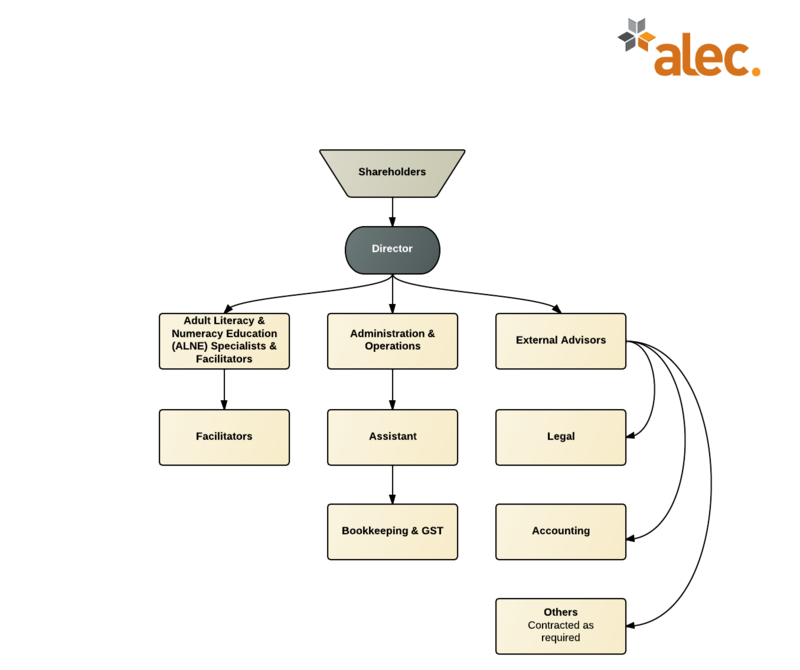 ALEC is a limited liability company founded in 2007 and wholly owned by the shareholders. The governance of ALEC lies with the two shareholders who are also the senior leadership of the company. All contractors report directly to the Director either verbally or electronically as appropriate. Because we are a small decentralised organisation we rely on tracked emails, phone conversations, and close working relationships as our main means of communication and reporting. Our key market segment is tutors and trainers delivering trades, vocational, foundations or other content specific training usually at levels 1-3 on the NZQA framework. This training is often funded by Student Achievement Component (SAC) funding or Youth Guarantee (YG) funding. These tutors are often employed by other private training establishments (PTEs), Institutes of Technology and Polytechs (ITPs), or Government Training Establishments (GTEs). Managers involved in delivering workplace or embedded literacy and numeracy. Staff from Industry training organisations (ITOs). LN experts and consultants who which to gain the NCALNE credentials. These tutors, trainers, and their organisations require and expect our training to be flexible and practical. Where we deliver face-to-face, our participants expect training to be enjoyable and engaging. In terms of our online and distance delivery, learners expect flexibility and sometimes creative solutions to problems they often pose about how they will complete the training or gather their evidence. In terms of customer support, learners expect us to be available by phone, email, and online in normal working hours, but also sometimes outside of this as well when they are working under pressure or are severely time constrained. Deliver around 100 qualified tutors per year. Support and promote the national infrastructure for adult literacy and numeracy that we now have in place in Aotearoa New Zealand including the Learning Progressions, Literacy and Numeracy for Adult Assessment Tool (LNAAT), and Pathways Awarua. Support the TEC’s Literacy and Numeracy Implementation Strategy 2012. Contribute to the upskilling and professionalising of the adult education sector, especially in the light of new requirements for SAC and YG funded tutors delivering foundations focused training at levels 1 and 2. Give effect to the current Tertiary Education Strategy (TES) and related priorities by delivering training outcomes that improve the literacy, numeracy, and language skills of New Zealanders. Another key stakeholder group is the NZQA. Most recently, ALEC was involved in the working party looking at the ALNE qualifications as part of the Targeted Review of Qualifications. Also, having staff complete ALNE qualifications assists other organisations in meeting their own NZQA compliance requirements. Communication is maintained with TEC through regular reporting as per contractual agreements and through approval, accreditation, and external evaluation and review (EER) with NZQA. ALEC’s key strategic partner at the present time is Pathways Awarua. As an online learning platform made in New Zealand with a focus on literacy and numeracy, ALEC and Pathways Awarua may have several opportunities moving forward. In general, developing open professional development learning pathways for adult literacy and numeracy educators that allow us and others to investigate new education business models that leverage new education technologies. Specifically, developing online interactive learning for the NCALNE (Voc) qualification under review as part of the current targeted review of qualifications. In terms of roles, ALEC can contribute existing and new ALNE content, resources, and ideas, and Pathways Awarua can contribute technical expertise in developing the material into online interactive content. Moving forward, production and delivery are likely to be shared as ALEC creates new material for the revised qualification and Pathways Awarua develops capability for online assessment evidence collection as well as content delivery. Next As software eats education, education companies will become media companies… but what about teachers?